What is the best way to research the AAHistoryLovers website? The best and simplest way to search the AAHL messages is to go to the Yahoo group website at: https://groups.yahoo.com/group/AAHistoryLovers. At the very top of the page, you will find a search box (the picture right above this paragraph shows what the top of the AAHistoryLovers page looks like on a Firefox computer browser). Type your search string in the box marked "Search Conversations" and then click on the button marked "Search Groups." In addition, all of the AAHistoryLovers messages from the years 2002 to 2012 are available for downloading at: http://hindsfoot.org/aahl.html. If you download them as MS Word files, you can use the normal search key function to search for any particular word or precise phrase. All these files are also stored on the private section of silkworth.net -- if you are a bona fide AA researcher and contact the moderator of that site at jim.myers56@yahoo.com he will tell you how to access the files there. All the Hindsfoot files are also stored on the private section of silkworth.net -- if you are a bona fide AA researcher and contact the moderator of that site at jim.myers56@yahoo.com he will tell you how to access the files there. 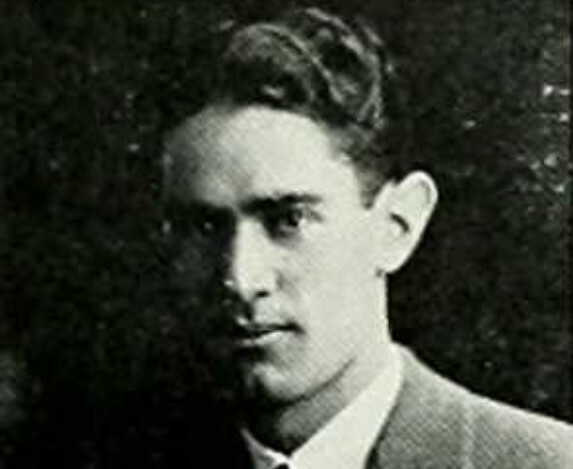 Psychiatrist Percy P. Poliak, yearbook photo from Colorado. He is mentioned on p. 43 of the AA Big Book: "Many doctors and psychiatrists agree with our conclusions. 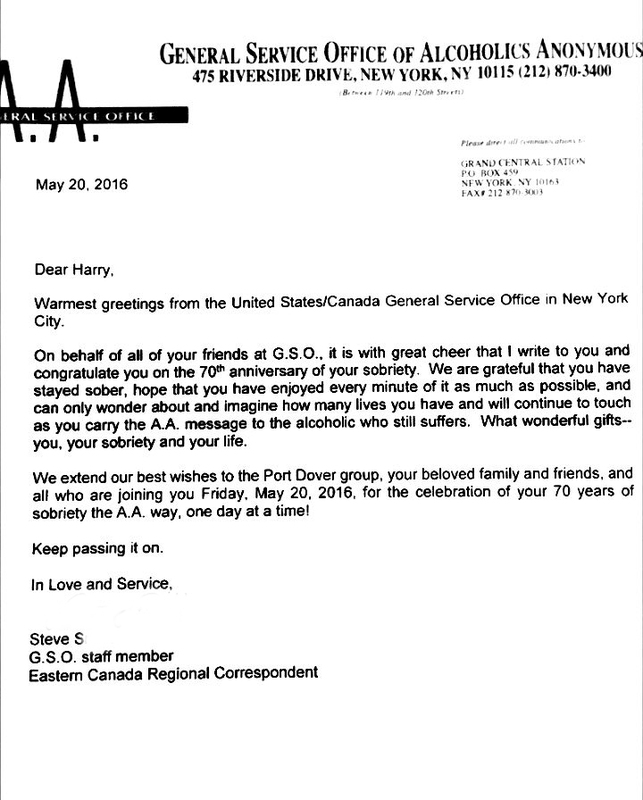 One of these men, staff member of a world-renowned hospital, recently made this statement to some of us: 'What you say about the general hopelessness of the average alcoholics' plight is, in my opinion, correct. As to two of you men, whose stories I have heard, there is no doubt in my mind that you were 100% hopeless, apart from divine help. Had you offered yourselves as patients at this hospital, I would not have taken you, if I had been able to avoid it. People like you are too heartbreaking. Though not a religious person, I have profound respect for the spiritual approach in such cases as yours. For most cases, there is virtually no other solution.'" How Bad Are Your Drinking Habits? An 18th-Century Temperance Thermometer Has the Verdict. By Rebecca Onion. The Vault is Slate's history blog. 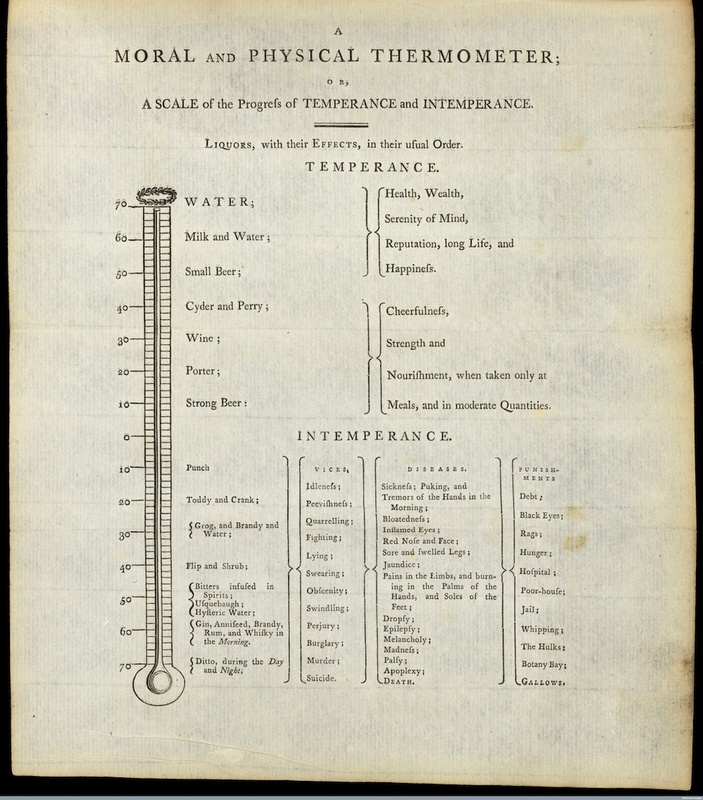 This "moral and physical thermometer" was published in English physician and abolitionist John Coakley Lettsom's Hints Designed to Promote Beneficence, Temperance, and Medical Science, in 1797. A guide to correct use of alcohol, the "thermometer" followed the early temperance movement's lead in endorsing moderate use of beer, wine, and cider, while predicting the direst of consequences for drinkers who indulged in anything stronger. The more familiar "temperance thermometer" is by Philadelphia physician (and signer of the Declaration of Independence) Benjamin Rush. Rush's version appeared in his pamphlet "An Inquiry into the Effects of Spirituous Liquors in the Human Body" in 1784, and was republished many times. Lettsom and Rush were friends, having met when Rush underwent medical training in London as a young man; they carried out a lifelong correspondence. Among the causes that the two shared was the temperance movement, and it makes sense that Lettsom would adapt Rush's idea for his own purposes. In Lettsom's chart, certain items have been Anglicized ("punishments" include "the hulks," or confinement to prison ships, and transportation to Australia's Botany Bay). Lettsom also published an illustrated version of this chart, with scenes of benefits and punishments dramatically sketched. I first spotted this variant of the temperance thermometer on historian Lee Jackson's Twitter feed. Hazard Family residence in Peace Dale, Rhode Island. 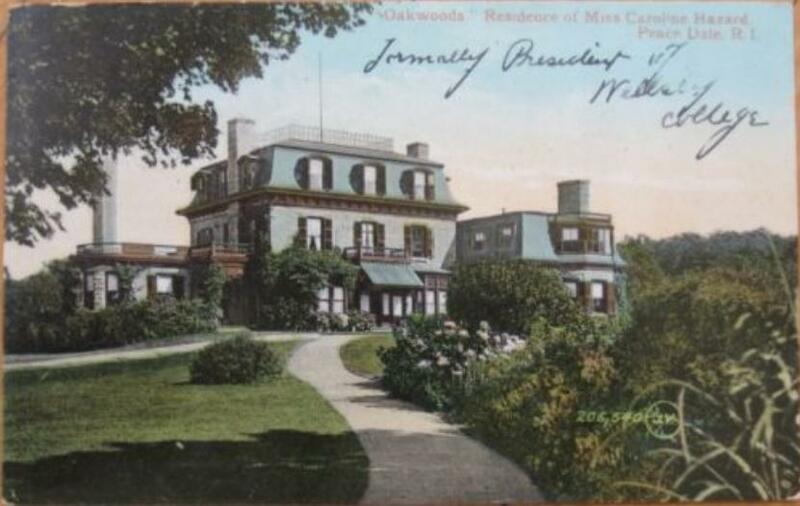 Caroline Hazard, Oakwoods, from a 1908 postcard. Bob S. (Richmond, Indiana) wrote in: "I am hoping to locate a picture of the Hazard Family residence in Peace Dale, Rhode Island, named, 'Oakwoods,' which burned down some years ago. It was doubtless very large because they jokily named their cousin Leonard Bacon's residence, 'Acorns,' because it was smaller -- Leonard's 'Acorns' house had 10 bedrooms! Many thanks to Jared Lobdell, who promptly sent us this excellent photo of the mansion. These two photos of Tex Adams (Sybil Corwin's brother) are courtesy of Arthur S. (Arlington, Texas). 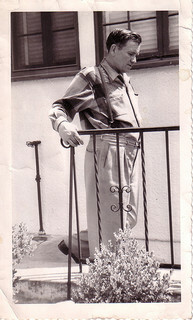 Tex Adams (Sybil Corwin's brother), was the founder of The Hole in the Ground group in Los Angeles. From "The First Woman in A.A. West of the Mississippi," by Nancy O. -- Sybil C. was the first woman to enter A.A. west of the Mississippi. Her date of sobriety was March 21, 1941. Her name at the time was Sybil Maxwell, though she later opened her talks by saying, "My name is Sybil Doris Adams Stratton Hart Maxwell Willis C., and I'm an alcoholic." She was born Sybil Doris Adams on May 20, 1908, in the small oil town of Simians, Texas. 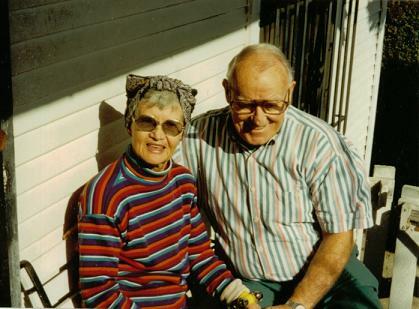 Her parents were poor but hardworking and she had a brother Herman, ten years her senior. 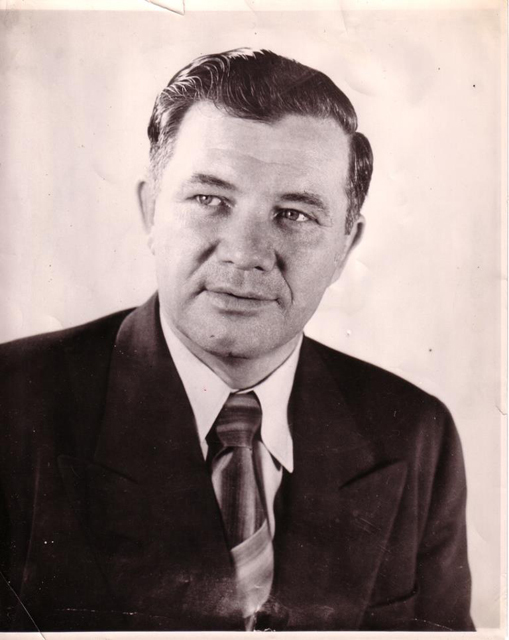 Herman was called "Tex." Sybil adored her big brother. She remembered that when she was five and he fifteen, he would hold her and rock her to sleep. Her brother, Tex, joined the week after she did. 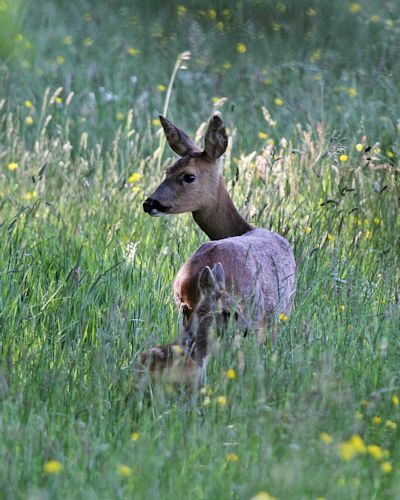 He started the second A.A. group in the area, and appointed Sybil coffeemaker and greeter for the new group, and finally made her deliver her first shaky talk. When Tex died in 1952, Sybil was devastated. She wrote Bill Wilson, pouring out her grief and asked, "What am I going to do, Bill? I don't crave a drink, but I think I'm going to die unless I get some answers." She said Bill's answer [a famous letter which he wrote her] saved her life. A small photo of a young Sybil Corwin. 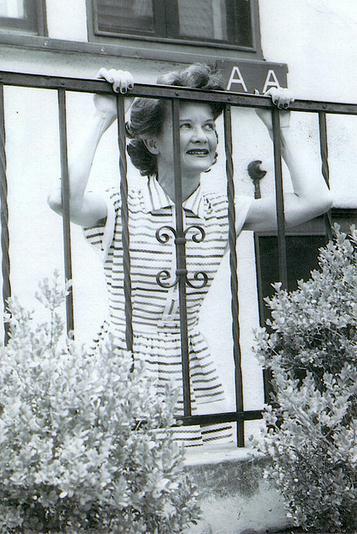 A photo of Sybil Corwin taken in 1961. Sybil Corwin and Bob Corwin. 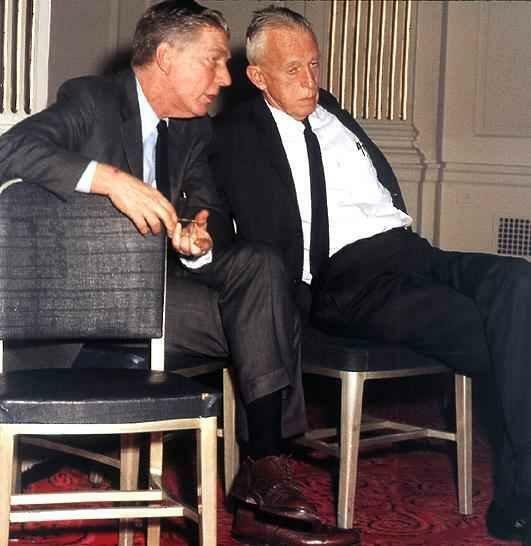 A photo of Bill Wilson (on the right) with Robert Thomsen (on the left), who wrote the first biography of the AA co-founder. This photo was taken by Tom White at the Roosevelt Hotel in New York City in 1967. Robert Thomsen's book was entitled Bill W: The absorbing and deeply moving life story of Bill Wilson, co-founder of Alcoholics Anonymous, and was originally published in New York in 1975 by Harper & Row. Tom White, who took this photo, was himself the author of a later (and also excellent) biography of AA's founder, entitled Bill W., A Different Kind of Hero: The Story of Alcoholics Anonymous.